Last week, Port.Today was invited to give a speech on the much-debated topic of the possible exit of Catalonia at the Propeller Club of Algeciras. The International Propeller Club of the United States was formed in New York in 1927 as a group of maritime professionals who met informally over lunch to discuss issues of the industry. As the Club was growing, its branches were opening in other port cities in the United States as well as in other countries. 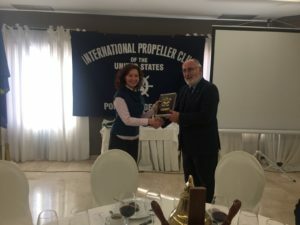 And now the Propeller Club is an international business network dedicated to the promotion of the maritime industry, commerce and global trade, with about 80 offices, or Ports as they are called at the Club, in various maritime locations around the world, including about 30 in Europe. In Spain, the Club is based in Madrid, Algeciras, Bilbao, Barcelona, Seville and Castellon. The topic of the possible Catalonian independence has again become aggravated recently with the new elections into the regional Parliament which were held last week, on 21 December, 2017. With 135 seats in the Catalan parliament, a party or bloc needs at least 68 to hold the majority, and although at the elections no single party won an outright majority, the three pro-independence parties together took 70 seats. The anti-independence Ciutadans party (Citizens) won 37 seats, the most of all other parties. However, these results do not mean an automatic move to independence, the intense negotiations on inter-parliament coalitions and on a candidacy of the next Catalonian president will follow. This process might further escalate and protract the current political crisis in Spain. By all means, this movement has its impact on the country’s and regional economy. Since 1 October 2017, when Catalonia held its independence referendum, over 3,000 companies have left Catalonia due to the uncertainty and economic risks, among them the large Spanish banks Banco Sabadell and CaixaBank; Gas Natural, which was established in Catalonia since 1843 and now moved its headquarters to Madrid; and other world-famous companies such as Codorníu, Cerveza San Miguel, Bimbo. As we already wrote earlier, the flee of the business from Catalonia is explained by the current uncertainty and the future risk of the region’s leaving Spain and consequently the European Union trading bloc, which would mean increasing the export costs for the goods produced in Catalonia and losing the protection of the European Central Bank. The ports, shipping and logistics business may also be affected. Apart from manufacturers moving their offices, the unstable and unpredictable situation in Catalonia results in reduced foreign investment. Thus, in Q3 2017 the foreign productive investment in Catalonia dropped by 75%, according to the recent data published by the Spanish Ministry of Economy. And this was not a sudden drop, rather it has been constantly decreasing since the announcement of the course towards the regional sovereignty. Thus, the average annual foreign investment in January-September 2013-2017 declined by 15.4% in Catalonia (EUR 2.5 bln), traditionally #2 investment destination in the country after Madrid, although in Madrid it rose by 20.4% (EUR 7.3 bln) and in the Basque Country it rocketed by 148% (EUR 1 bln). Once Catalonia becomes independent, will these foreign investments be available to Catalonian transport infrastructure and ports? Let us not forget that the main Catalonian container terminals are all operated by foreign companies: in Barcelona, the Hong Kong-based Hutchison Ports operates BEST (Barcelona Europe South Terminal) container facility of 2.6 mln TEU capacity and the Danish APM Terminals operates former TCB terminal of 2.3 mln TEU capacity, whereas the only container terminal (450,000 TEU) at the port of Tarragona is managed by Dubai-based DP World. Will these port facilities maintain their traffic after the Catalexit? Will the international vessels be allowed to call these ports? At the moment we do not have a clear picture of possible consequences.